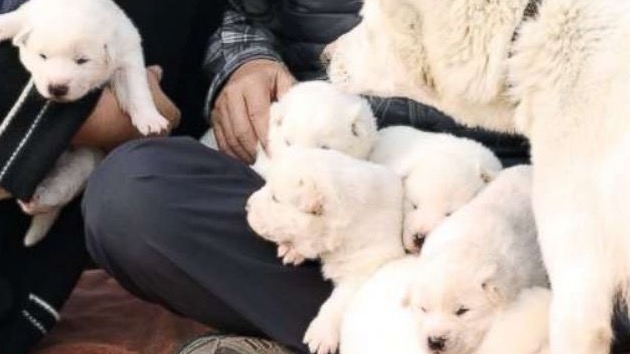 South Korea's presidential office on Sunday introduced a half dozen "peace puppies," offspring from a traditional North Korean hunting dog that was a gift from Kim Jong Un. (SEOUL, South Korea) — South Korea’s presidential office on Sunday introduced a half dozen “peace puppies,” offspring from a traditional North Korean hunting dog that was a gift from Kim Jong Un. The North Korean leader in September presented a pair of dogs, from a breed called pungsan, to President Moon Jae-in when he visited Pyongyang for the third inter-Korean summit. One of the gifted dogs, named Gomi, gave birth to three males puppies and three female puppies earlier this month. It’s not the first time pungsan dogs have been given by North Korea to South Korea — Kim Jong Il presented some to then-South Korean president Kim Dae-jung.